An increase in the heart size and weight in the medical language is indicated as hypertrophy of the myocardium. 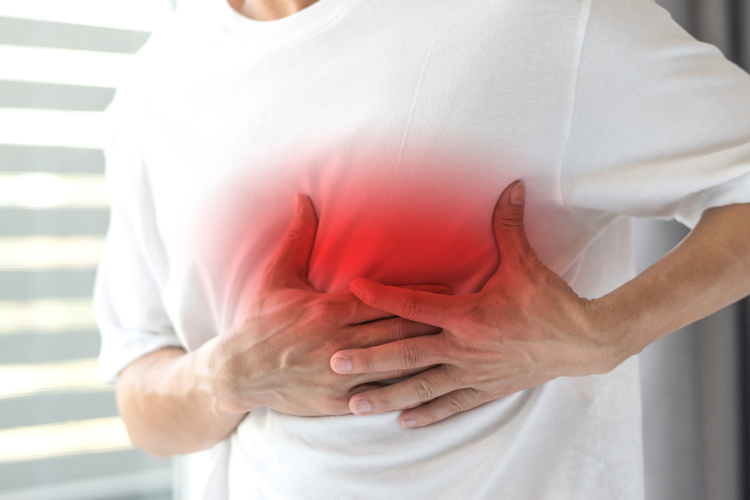 The development of a pathological condition is often associated with other cardiovascular, endocrine and somatic diseases, and therefore it is considered a complication. Myocardial hypertrophy (GM) is a complex type of heart disease that affects the heart muscle. Causes the thickening of the myocardium (especially the ventricles or the lower parts of the heart), contributes to the appearance of rigidity of the left ventricle, the change of the mitral valve and disorders at the cellular level. The thickening of the heart muscle (myocardium) occurs most often in the partition. The partition is a muscular wall that separates the left and right sides of the heart. Problems arise when the partition between the lower chambers of the heart or the ventricles is thickened. The altered partition can cause narrowing, which helps block or reduce the blood flow from the left ventricle to the aorta. 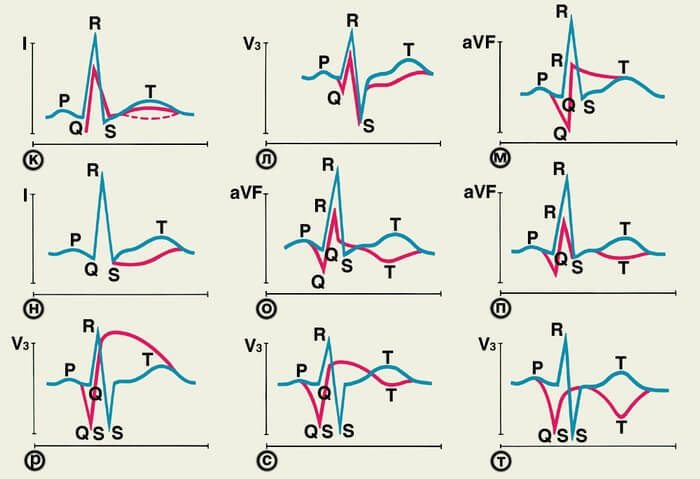 The ventricles should pump blood more strongly to overcome the strength of the resistance. This type of hypertrophic cardiomyopathy is often referred to as hypertrophic obstructive cardiomyopathy (GOKMP). The GM can be caused by thickening not only in the septum, but also in other parts of the heart muscle. For example, the lower part of the heart, called the apex, may also be affected, as well as the right ventricle or the entire left ventricle. 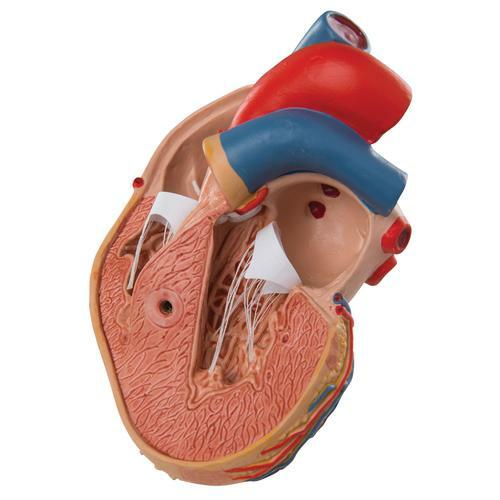 The stiffness in the left ventricle occurs as a result of cellular changes that occur in the myocardium when it thickens.Moreover, the left ventricle can not normally relax and fill with blood. As the blood in the chamber is gaining less, organs and muscles receive insufficient amount of oxygen. The rigidity of the left ventricle helps to increase the pressure in the heart, which can lead to clinical signs. Changes in the mitral valve contribute to narrowing the pathway of blood flow to the left ventricle, which again leads to an increase in pressure in the left lower chamber of the heart. Obstruction is the result of the entry of the mitral valve into the septum. When this happens, the mitral valve stops closing closely, which results in the return of blood (regurgitation) to the left atrium. Changes in the cellular level, or destruction of the cells of the heart muscle, lie at the heart of the development of GM.Under a microscope, cells taken from hypertrophied myocardium appear to be disorganized and arranged in the wrong order, rather than being arranged in a strictly parallel manner. This disorder can cause changes in electrical signals passing through the lower chambers of the heart, and lead to ventricular arrhythmias and other abnormal heart rhythms. The development of GM in turn goes through three stages ( respectively, F. S. Meerson ). 1. 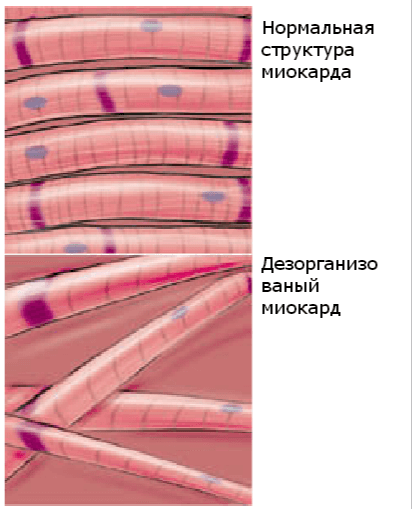 Active development of hypertrophy During its passage, the number of myocytes increases, due to which the thickening of the myocardium occurs. 2. Stage of stable hyperfunction In this period of the disease, the compensatory mechanisms work well, so the symptoms are practically absent, although with the prolonged exposure to physical activity, the appearance of the clinic is possible. 3. Stage of decompensation There is an exhaustion of myocardial capacity. The heart begins to perform its functions worse. In addition, sclerotic changes in the heart muscle begin to develop. There is a concept that an increase in the weight of the heart to 500 g occurs due to the growth of the mass of the most cardiomyocytes. In addition, there are changes associated with the appearance of new cardiac cells. Until the end this assumption has not been studied. GM may be inherited, that is, it is caused by an anomaly in the gene responsible for the functional features of the cardiac muscle. There are many genes that may cause GM damage. The type of developing hypertrophy varies greatly within a single family. In addition, some people with the genome of GM can never get sick, while others have the disease due to high blood pressure or due to aging of the body. In some cases, the cause of myocardial hypertrophy remains unknown. Because GM causes vary widely, it is often difficult to identify a high-risk group. GM affects about 600,000 to 1.5 million Americans or one in 500 people. GM is more common than multiple sclerosis, which affects one in 700 people. Sudden cardiac arrest and sudden cardiac death , developing due to sudden loss of heart function or loss of heart function. This causes a life-threatening heart rhythm, called ventricular tachycardia. If emergency treatment, including CPR and defibrillation, is not performed immediately after the onset of symptoms, a person may die. Most people with HM have a low risk of sudden cardiac death. Nevertheless, GM is the most common cause of death in people under the age of 30. Also, GM today is best known for its role in stopping the heart and the subsequent death of some young professional athletes. Heart failure , in which the pumping capacity of the heart is noticeably weakened due to what the functioning of the whole body is disturbed. Pain in the chest or feeling of pressure , usually occurring with physical activity or physical activity. These symptoms can also be taken during rest or after eating. Shortness of breath and fatigue , especially when exercise. These symptoms are more common in adults with myocardial hypertrophy and are most likely due to compensatory pressure in the left atrium and lungs. Awakening is a condition that can significantly affect patients with HM. Fainting at the GM may be caused by irregular heart activity, an irregular blood vessel reaction to ongoing training, in the extreme case, the cause can not be found. The heartbeat (trembling in the chest) develops due to abnormal heart rhythms (arrhythmias) such as atrial fibrillation or ventricular tachycardia. Inertia arrhythmia occurs in approximately 25% of patients with GM and increases the risk of thrombus formation and heart failure. 1 History of the disease . For her evaluation, the attending doctor asks the patient questions about the symptoms and family predisposition. 2 Physical examination . The doctor listens to the work of the heart and lungs. In patients with hypertrophic obstructive cardiomyopathy, heart rhythm may be detected. a. Echocardiography , which is the most common diagnostic method used to detect HM . To confirm the diagnosis, a characteristic thickening of the walls of the heart should be present. b. Other tests , which may include blood tests , electrocardiography, chest X-rays, echocardiography with physical activity, cardiac catheterization, and magnetic resonance imaging (MRI). Is there a narrowing in the area of ​​the path of the outflow of blood. The quality of the work of the heart. Age and level of activity of the patient. 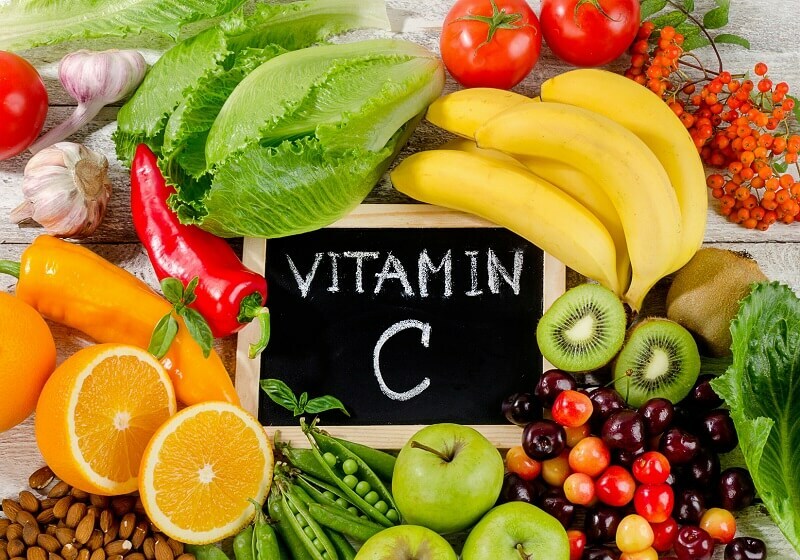 Treatment is mainly aimed at minimizing or preventing the development of life-threatening symptoms and reducing the risk of complications such as heart failure and sudden cardiac death. GM therapy is aimed at identifying the risk and regular observation of the patient, as well as changing lifestyle, correcting medicines and procedures, and using surgical intervention if necessary. Hypertrophy of the myocardium is a disease that can be transmitted from generation to generation. It is important for the patient or family members to undergo an examination, especially if there is a first-line relative to the disease. Relatives of the first line are parents, brothers, sisters and children. The first step is to conduct electrocardiography (ECG) and echocardiography (echocardiography) to check the condition of the heart. If the diagnostic results point to signs of myocardial hypertrophy, you should contact a cardiologist who specializes in GM. If the test results are normal, a repeated echocardiographic study and ECG are usually proposed three years before the age of 30, and then the control tests are done every 5 years. Most people with HM have a low risk of sudden cardiac death. Nevertheless, it is important to take preventive measures to determine the small number of patients with HM who are at higher risk of sudden cardiac death. Patients with unfavorable heredity due to sudden cardiac death. Young patients who had several episodes of syncope (syncope). Patients who experience an abnormal blood pressure response to exercise. Patients with history of arrhythmia or with a rapid heartbeat. Patients with severe symptoms and poor heart function. The doctor, as a rule, individually discusses personal risk with each individual patient. If there are two or more risk factors for sudden death, the doctor may prescribe prophylactic procedures, such as antiarrhythmics, or implantation of a cardioverter defibrillator (ICD) to reduce the risk. Medications are often prescribed to treat symptoms and prevent further complications. Medicines, such as beta-blockers and calcium channel blockers, relax heart muscle, allowing it to relax more effectively and more effectively. Other drugs may be prescribed as needed to control the frequency of heart attacks or to reduce the likelihood of arrhythmias. If necessary, you may be asked to avoid certain medications, such as nitrates, because they lower blood pressure. Also, digoxin is not recommended, which increases the strength of heart contraction. Additionally, antibiotics can be used to reduce the risk of bacterial endocarditis, a potentially life-threatening condition. 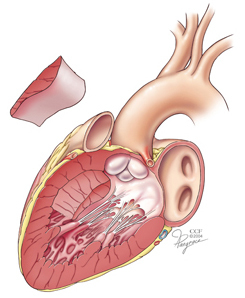 Procedures for treating hypertrophic obstructive cardiomyopathy include septal myectomy, ethanol ablation, implantation of a cardioverter defibrillator, and treatment of heart failure, if necessary. During this surgical procedure, the doctor removes a small amount of thickened wall of the septum, which allows to expand the pathway for the outflow of blood passing from the left ventricle to the aorta. Myectomy is performed when the medications are not effective in treating GI. With its help it often eliminates regurgitation of the mitral valve. 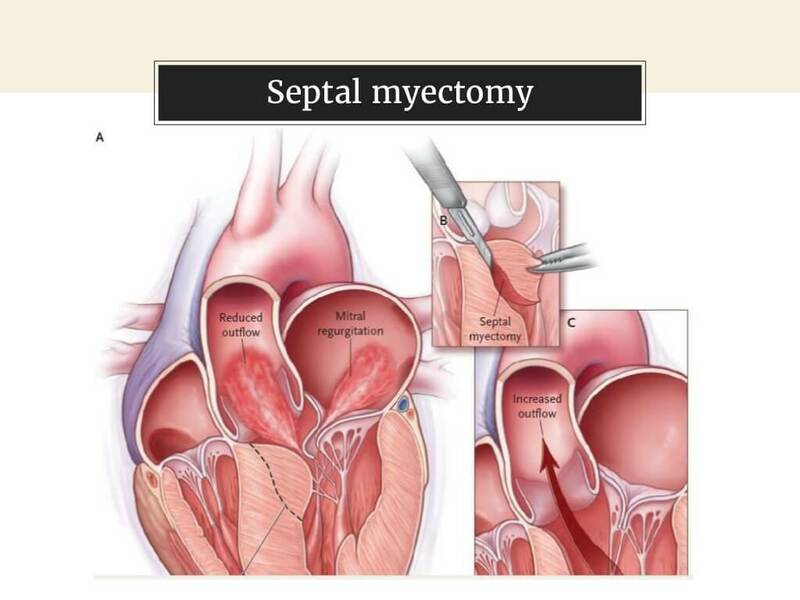 This procedure, also called the ablation of the septum, is shown to patients who are not suitable candidates for septal myectomy. 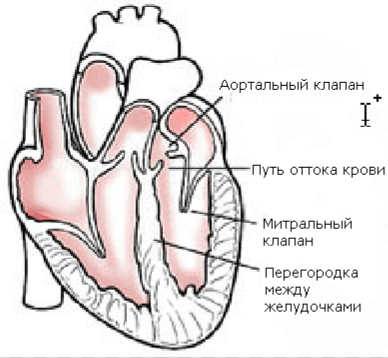 The ablation procedure is performed in the department of catheterization of the heart. During a minimally invasive intervention, a small coronary artery is used which provides the blood flow to the upper part of the septum. The balloon catheter is inserted into the artery and inflated. Contrast material is used to determine the thickened partition wall, which narrowes the passage from the left ventricle to the aorta. When a pathological region is detected, a small amount of pure alcohol is introduced through the catheter. With its help kill myocardial cells, which causes the reduction of the septum to a more normal size over the next months. This expands the passage for blood flow. ICD is recommended for patients at high risk of developing arrhythmias and sudden cardiac deaths. The cardioverter defibrillator (CD) is a small device located directly under the skin and connected to wires that pass through the vein to the heart. The CD constantly monitors the heart rhythm. When the device detects very fast, abnormal cardiac activity, it generates an impulse (small but powerful enough) that is sent to the heart muscle to normalize the rhythm. Correction of the habitual way of life, as indicated below, is necessary for the proper management of the GM. Limiting fluid and salt may be necessary for some patients, especially if there are symptoms of heart failure. In this case, you must ask your doctor for specific nutrition and fluid recommendations, including information about alcohol and caffeine products. Exercise Most patients with hypertrophic cardiomyopathy can engage in unprofessional aerobics. Weightlifting and many types of high intensity sports are not recommended. Regular visits to the doctor . Patients with HM should observe the medical consultation mode in order to control the general condition. Reducing the risk of infection . If there is a risk of developing an infective endocarditis, appropriate preventive measures should be taken in the form of antibiotic therapy. 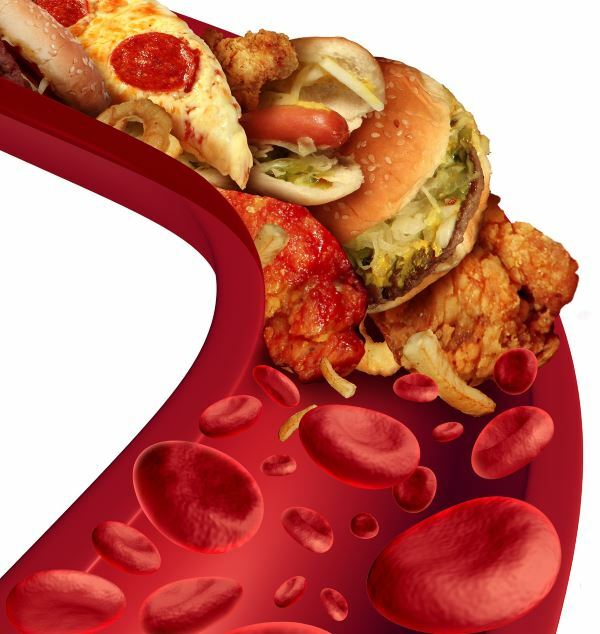 Additionally, it is important to eat properly, that is, to eat foods that strengthen the heart and blood vessels. 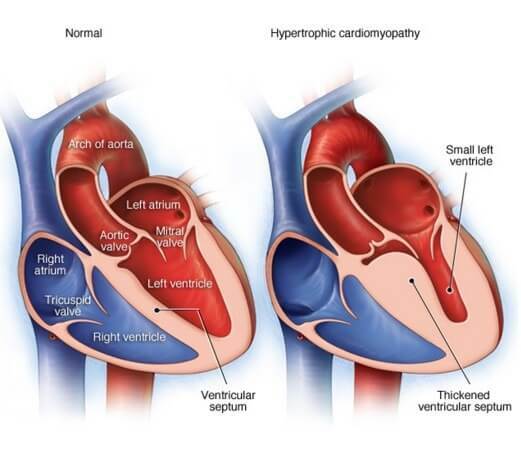 Hypertrophy of the myocardium is a serious disease that can lead to severe complications. The definition of the stage of hypertrophy of the myocardium is necessary to formulate the most appropriate treatment strategy. Most often, the prognosis for GM is favorable, although in the absence of adequate therapy or ineffectiveness of the treatment already performed, heart failure may develop. Increased load can lead to thickening of the muscles not only of the arms and legs, but also of the heart. In this case, they say about myocardial hypertrophy and a similar condition is a pathology, since it can lead to serious consequences. 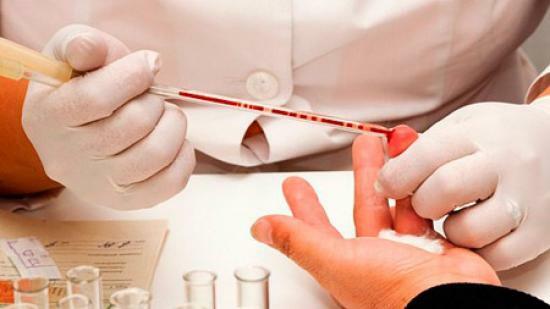 Treatment of the disease can improve the condition of the patient and maintain its performance over a long time.